This project is being designed for SciWorld a South Australian not-for-profit organisation full of people who are passionate about science. They provide science outreach programs in various locations around Adelaide and South Australia. The jumping ring experiment demonstrates how a conducting non-magnetic ring can be thrown into the air using an alternating magnetic field. The well-known experiment was originally discovered by Elihu Thomson an English engineer and inventor (March 29, 1853 – March 13, 1937). An aluminium, copper or brass (non-magnetic) ring is placed over an iron core with a coil at the base. The coil is connected to an alternating current (AC) supply and when switched on the observer(s) will see the ring jump quickly into the air reaching a height of about 1 meter. The height of this jump can be dramatically increased by cooling the ring to the temperature of liquid nitrogen (-196 °C). The ring may easily jump to a height well over 6 meters! 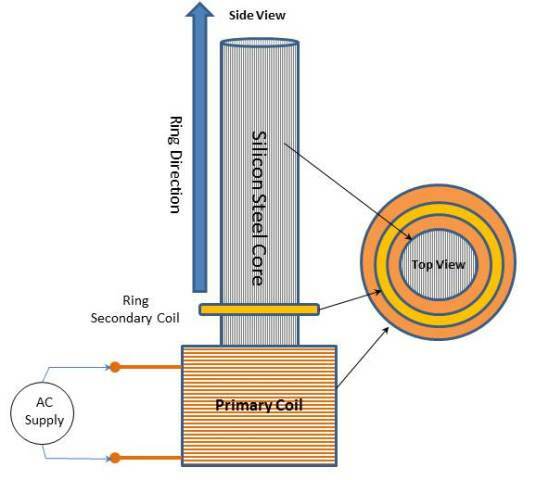 The coil, the ring and the core act as a transformer. The ring in this case can be considered as the secondary coil. The induced current in the ring produces a magnetic field in such a way that the ring is repelled. A stronger magnetic field is produced when the ring is cooled, so it will jump to a greater height. At low temperatures, metals will have lower electric resistance and so electric currents can reach higher values, and so the repelling force will be stronger.